U.S. Bank Stadium in Minneapolis is one of a new generation of glassy, modernist, roofed football stadiums. There is no shortage of metaphors to describe Minneapolis' new, otherworldly U.S. Bank Stadium, which will have its star turn next week when the city hosts the Super Bowl. Locals have dubbed the year-old stadium "The Sandcrawler" after the mobile fortresses that rumble across the Tatooine deserts in the Star Wars films. To Minnesota's ethnic Scandinavians, its enormous jutting prow suggests the Viking ships their ancestors sailed across Earth's oceans. Architecture buffs see echoes of California's Crystal Cathedral embedded in its shimmering, faceted, glass walls. As for the designers at HKS Architects, they modestly claim the roof's sharp angles are just a way of managing the Twin City's prodigious snowfall (some 45 inches a year on average), a strategy they borrowed from the A-frame lake cabins that dot the Minnesota landscape. Designed by HKS Architects, U.S. Bank Stadium is a glass carapace that houses much more than a football gridiron. Whatever the inspiration, the colossus where the Philadelphia Eagles will do battle against the New England Patriots is a riveting architectural form that also represents the latest escalation in the luxification of stadium design. The billion-dollar home of the Minnesota Vikings is so design-conscious and so extravagantly outfitted with restaurants, fireplaces, meeting rooms, and private boxes it is hard to believe it is descended from the same architectural stock that produced football's original oval coliseums. Football stadiums first started ramping up the luxury quotient some two decades ago as a way to attract more nonsports events and generate revenue, said Benjamin Flowers, a Georgia Tech architectural historian and author of Sport and Architecture. Philadelphia's Lincoln Financial Field, which opened in 2003, was notable at the time for including sophisticated, hotel-style lounges with modern furniture and original artwork. But its exterior architecture still skewed toward the traditional, especially in its redbrick main entrance. 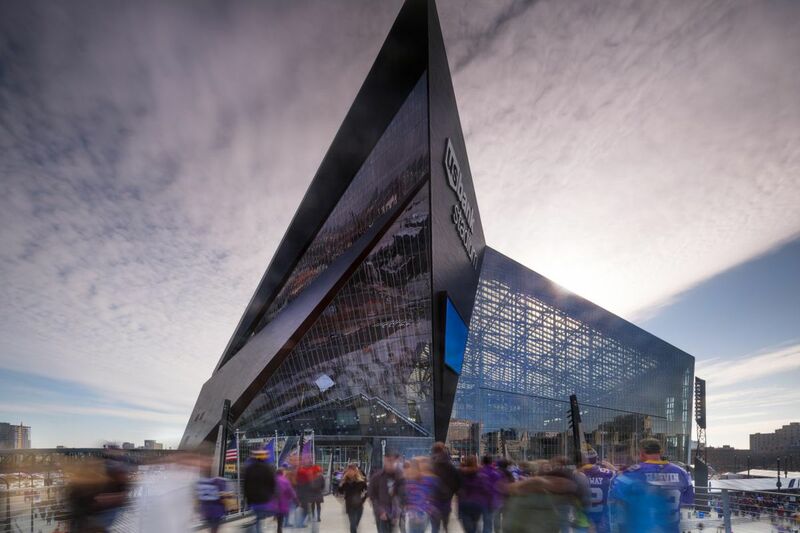 With its sculpted glass carapace, U.S. Bank Stadium has turned the arena into an architectural bauble, a brandable object that aspires to more than football. It's not the only one, either. Atlanta's Mercedes-Benz Stadium, which opened this year and which also goes heavy on the glass, has similar aspirations. "People now have surround-sound TV. They need a reason to leave the house," Flowers said. Design helps bring them into the stadium. So do business meetings, concerts, and restaurants. They now generate more money than the games. More than 600 events were held at U.S. Bank Stadium in the first year, including University of Minnesota football and baseball games. The management even rolls real grass over the artificial turf for soccer games. But it is the transparent shells that distinguish the Minneapolis and Atlanta stadiums from previous luxury venues. They are the sporting equivalent of the see-through skyscrapers that have been taking over America's urban skyline. Sleek, sculptural, and virtually scaleless, those towers are prized by their corporate tenants for fantastic views that blur the division between inside and out. The glass walls of U.S. Bank Stadium in Minneapolis admit natural light and allow fans to the skyline. Fans who have been to U.S. Bank Stadium say they never feel as though they are locked inside a 70,000-seat room. On the southwest side, a soaring glass wall perfectly frames the Minneapolis skyline. Watching a day game, St. Paul architect Andrew Wise told me, he felt as though he were outside — without being subjected to Minnesota's subzero winter temperatures. "The amount of natural light inside is impressive and beautiful," Wise, a Pennsylvania native, wrote in a Twitter exchange. It's always a balmy 72 degrees in the main arena. Given how much television emphasizes local attractions in its sports broadcasts, it's surprising that it took this long for architects to wrap football stadiums in glass. Older domed stadiums, like Minneapolis' Metrodome, were generic and hermetic spaces — you could be anywhere. The technology used in their roofs was also problematic. The Metrodome roof collapsed five times under the weight of Minneapolis' heavy snow before the state and team owners began making plans for a replacement in 2012. The roof of the U.S. Bank Stadium in Minneapolis is made of three layers of ETFE, an incredibly strong, transparent plastic. They initially wanted the new arena to include a retractable roof, said John Hutchings, who led the HKS architecture team. But after construction estimates started approaching a billion dollars — twice what the Linc cost — Minnesota officials cut that element out of the projects. "We figured it only gets opened two or three times a season," Hutchings said. The decision led the architects to come up with a solution that brought in even more light. They covered a large portion of the roof in sheets of ETFE, an incredibly strong, transparent plastic. It's the same material that gave Beijing's National Aquatics Center its soap-bubble walls in the 2008 Olympics. The lower walls of U.S. Bank Stadium are a strategically placed mix of glass and zinc panels arranged to maximize daylight and minimize glare. That leaves parts of the field in shadow, though Hutchings says no team has complained. Because the Super Bowl starts at 6:30 p.m., most of the game will be played at night. Like all glass buildings, U.S. Bank Stadium has a serious drawback, one that Eagles fans should know in advance: It's a bird-killer. The Audubon Chapter of Minneapolis, which attempted to get the architects to modify the glass walls before construction, says the arena has become the deadliest building for birds in Minneapolis because it is only a few blocks from the Mississippi flyway. Workers scoop up a dozen or more carcasses from the perimeter every day, the group found. In other ways, however, the design is far more environmentally sound than its predecessors, which were surrounded by acres of parking. Minneapolis' stadium is served by light rail and the city's 6.5-mile skyway system, which links all the downtown high-rises. The Minnesota Vikings encourage "rail-gating" over tail-gating. Fans can take light rail or the covered 6.5-mile skyway to U.S. Bank Stadium in Minneapolis. Fans can walk from their downtown hotels to the arena without ever going outside. That network, along with the furnished lounges, carpeted corridors, and fireplaces inside the stadium, increases the sense that the building is a blend of modern building types — airport, hotel, convention center all rolled into one. Philly.com sports columnist Bob Brookover told me he expects Eagles fans to feel right at home in U.S. Bank Stadium. For one thing, it's a noisy space because of the roof. The Eagles should also have the home crowd advantage, he believes. Because the Patriots have been in so many Super Bowls, he predicts fewer of their fans will be willing to shell out the roughly $6,100 necessary for a game package that includes tickets, a flight, and hotel. If they arrive early enough, they should even have great daylight views of the city through the arena's glass. Given the nature of the material, maybe it wouldn't hurt for the building owners to stock a little Crisco. The Sandcrawler was a mobile fortress that figured in several “Star Wars” films.